Home » Got Neck and Shoulder Pain? A Case Study. If you have it, you’re a probably a sitter or someone who stresses very easily. Friends and family, if they pay attention, notice you grabbing the crook of your neck several times per day. And you LOVE when your people walk up to you without you noticing, put your hands on your neck, and allow you to relax. You literally melt underneath their fingertips. Unfortunately, their work never lasts, and you wake up the next day with the same pain, all over again. Contributing to the Great Spaghetti Phenomenon of the 21st Century. Leenie is a 28 year-old CrossFitting, rugby player. As a nurse, she’s always willing to help others out. She’s been a patient for several years and rarely every complains. One of those people who was born with one hand and does more with her life than most. Leenie has had on-going neck and shoulder pain. In order to get Leenie as pain-free as possible before she moves from New Jersey to Arizona, given her one hand and high volume of exercise, we separated her pain into two pieces, then prioritized which pieces was a bigger problem. You might be reading this, thinking you missed something by what we did as her doctors. Of course. a reputable doctor would figure out what the biggest problem is and address that first. Obviously, something’s missing. I digress. For Leenie, her shoulder range of motion was 170 degrees, equating to 75% function in her shoulder. Her neck range of motion, as evidenced by her CT Flexion (“C” = cervico = neck, T = thoracic = upper back), was 52 degrees, equating to 57% function in her upper back to neck. 57% function (neck) is a bigger problem than 75% function (shoulder), so her neck is a bigger priority. 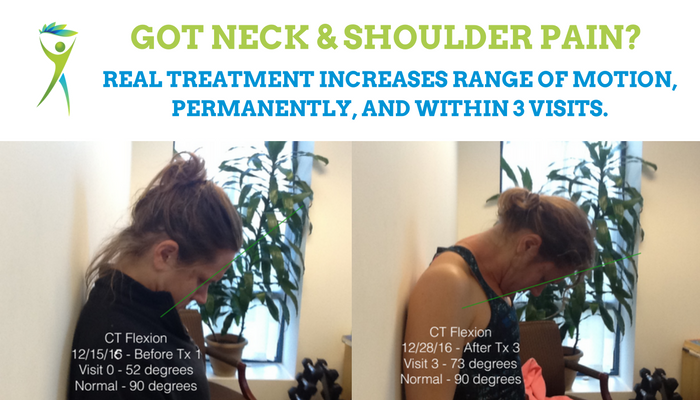 Therefore, we treated her neck and improved her range of motion to 73 degrees or 80% function in her neck and upper back in three treatments. That’s the change in her flexiblity. How did Leenie feel about it? DOCTOR: Finding a reputable therapist or doctor. When people contact us from out-of-state with pain, we relay them to Integrative Diagnosis’s Find A Provider Search. RANGE OF MOTION: Find out your ranges of motion and function in all relevant joints. ADHESION: Get the adhesion removed. DIAGNOSIS: If your range of motion doesn’t improve like Leenie’s did, get a better diagnosis. Usually, that requires getting a x-ray or MRI. 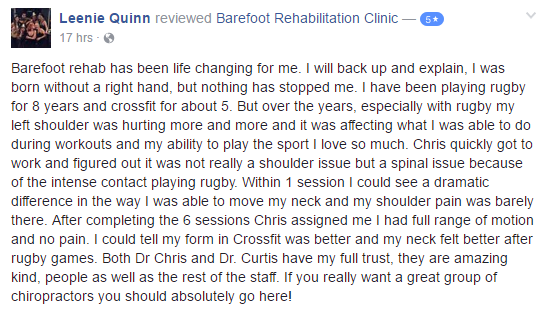 Regarding #1 above, if you live in NJ/NY, call us at Barefoot Rehab to schedule a FREE 15 minute consultation to discuss your condition. We can’t help everyone, but there are questions we can ask you to confirm if you’re a good candidate for success or not. If you live outside NJ/NY, visit Integrative Diagnosis’s Find a Provider section to find someone near you. What have you tried to get out of neck and shoulder pain? What do you think the #1 problem is for your pain? Share in the comments below.